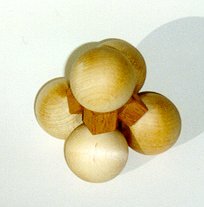 This modification, using little cubes instead of the small spheres, was introduced by Tom Lensch. He also made this beautiful prototype. Joke solution using only two parts out of three. 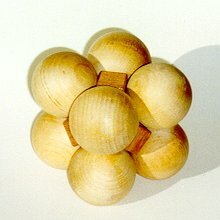 The KubaLL� is a three-dimensional puzzle, based on a physical phenomenon of the dense spatial package of spheres. The KubaLL� consists of three parts. Each part is a chain of spheres coupled together rigidly and placed within one plane which is important from the point of view of molding the design. 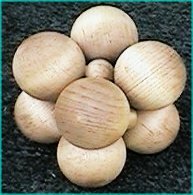 The KubaLL� puzzle assembles with mutual parts clutching to form a firm cubical shape. Judging by the triangular shape of most of the parts, the solution is far from obvious.